Most creatures on the earth have body clock mechanisms that adapt to the 24hr cycle accompanying Earth's rotation and revolution and engrave the rhythm in the body. A chronobiology research has been progressed with the elucidation of this circadian rhythm . The circadian rhythm oscillation, transmitted from the hypothalamic suprachiasmatic nucleus (SCN), is involved in various biological phenomena such as sleep, hormone secretion, division and proliferation of cells. At the same time, the network of clock genes, which is ubiquitously expressed in constitutive cells of the peripheral organs, also holds its own circadian rhythm which together manage hierarchical and dual "time of living” . Although there are many reports on functional analysis of individual clock genes, Cryptochrome (Cry) gene knockout mice show phenotypes of arthritis exacerbating mice exhibiting the unique ability of T lymphocytes that produce higher amount of tumor necrosis factor (TNF)-α , and the stimulation by TNF-α on cultured rheumatoid synovial cells suppresses the transcriptional activity of Period (Per) gene via D-box  (Figure 1). Figure 1. Network of the molecular clock. On the other hand, melatonin secretion produced from pineal gland during daytime is suppressed when the light signal reaches the pineal gland which is transmitted to SCN from the retia. Melatonin secreted at night regulates the circadian rhythm by maintaining the sympathetic sedation and parasympathetic dominance, resulting in natural sleep induction. Interestingly, in cases with rheumatoid arthritis (RA) patients, melatonin secretion in midnight is elevated more than in healthy subjects. And melatonin is detected in synovial tissue macrophages and RA patient joint fluids . Then, if it is asked whether sleep of RA patient shows deep and healthy one depending on melatonin, it cannot be said at all. In fact, RA patients are more frequently exposed to night-time awake sleep disorder, which is characterized by an increase in arousals after sleep onset and a lowering of sleep efficiency. Melatonin rather promotes inflammation in RA patients. For example, when human peripheral blood mononuclear cells are stimulated with melatonin, cytokines such as interferon (IFN)-γ, interleukin (IL)-1 and IL-6 are secreted. Among them, Lipopolysaccharide (LPS)-dependent TNF-α secretion increases at night, which is significantly enhanced by the addition of melatonin. When these phenomena are considered in accordance with human life cycles, the peaks of the cytokine secretions fall early in the morning after the melatonin blood concentration peaks in human bodies. This suggests an important role of circadian rhythm for joint symptoms, sleep and cytokine secretion in RA patients [6,7]. In relation to the pathogenesis and treatment of RA, we have reported new roles of clock genes. 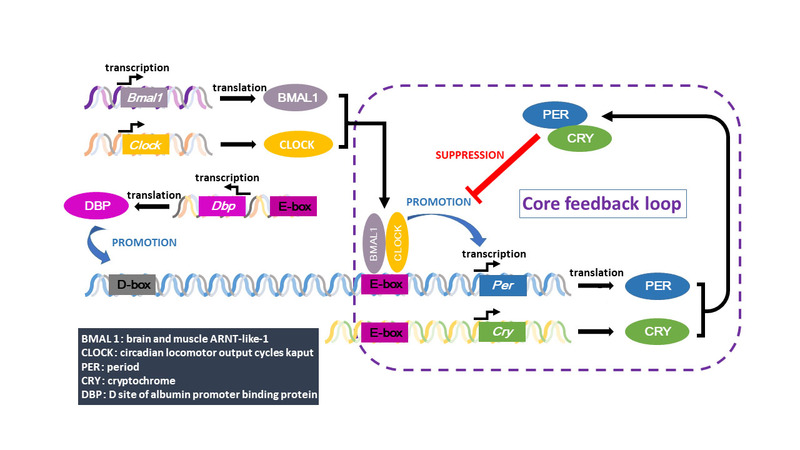 TNF-α did not influence the oscillation phase of Rev-erb α, a transcriptional repressor of another important clock gene Bmal1, while enhanced those of Ror α, a transcriptional activator of Bmal1. Thus, TNF-α induced the over-expression of Bmal1 in synovial cells . In the therapeutic function of Methotrexate (MTX), an anchor drug for RA treatment, MTX upregulated the binding of circadian transcriptional factor PAR bZIP to D-box elements of Per2 and pro-apoptotic Bcl-2 interacting killer (Bik) promoters, to induce apoptosis in synovial cells . In recent years, there have been reports that circadian rhythm modulation involves not only sleep disorder but also diurnal variation of insulin secretion, pathogenesis such as hypertension and carcinogenesis. In the field of RA treatment, chronotherapy has also been attempted by shifting internal administration time and sustained release action of methotrexate or prednisolone at night, in anticipation of enhancing the drug effect . ©2018 Hashiramoto A. This is an open-access article distributed under the terms of the Creative Commons Attribution License, which permits unrestricted use, distribution, and reproduction in any medium, provided the original author and source are credited.